Howdy and welcome to Flawed yet Functional! If you are looking for how to start managing your Type 1 Diabetes (or Type 2!) with less severe blood sugar spikes and less insulin (maybe no insulin! ), you are in the right place. This page is a resource for anyone looking to manage diabetes or autoimmune diseases through diet, exercise, and healthy habits. Type 1 Diabetes is an autoimmune disease which means the immune system is reacting to some invader and is attacking parts of the body. In recent years, medical research has shown autoimmune diseases to have triggers from the food we eat, primarily gluten. Gluten getting through the walls of the intestines before being fully digested is the invader the immune system sees. I know what you are thinking. Gluten? That’s just a fad. The latest thing to blame for our health problems! I used to be right there with you. Know that you are in good company if this is where you are starting. I’ve used my body as a real live science experiment, and I’m can truly say gluten has a major effect on my blood sugar, gut health, and hormone balance. There is a lot of information on this page so pull up a comfy chair and get ready to read! If you have any questions along the way, comment on the post or send me an email. I’m happy to answer your questions! I’ve had a varied medical history which I still find somewhat unbelievable since I grew up thinking I was the picture of health. Truth be told, I only thought I was healthy because I was thin. If I had the capacity then to realize it, my thoughts about health (barely eating/obsession over weight/crazy exercise) were unhealthy in and of themselves! That’s another story for another day! Take a look through the posts below to level set my starting point in this journey. About two weeks into my life as a Type 1 Diabetic, I started Googling things like “type 1 diabetes misdiagnosis” which led me to a search for “spontaneous remission of type 1 diabetes.” I was really in denial of my diagnosis. Unfortunately for my high hopes, there are cases of misdiagnosis and spontaneous remission! The real nugget I found was one medical study about a boy who had put his diabetes into remission by going on a gluten free diet. The diet worked! After 20 months, the boy was still without additional insulin and the group stopped monitoring him. Wow! That was it for me. I fully realize the thinness of my medical support (I found more later! ), one study on one boy, but I had to give it a try for myself. As you might have guessed, it worked! Check out my real-time posts after this discovery to see how I felt and how things changed immediately for my blood sugar. Removing gluten from my diet has impact more than just my management of Type 1 Diabetes. It has improved my skin, nails, hair, and mood. After being gluten-free for four weeks, I started to notice my fasting (morning) blood sugar creeping up. I tried going back on long-acting insulin, but even at the smallest adult dose, 1 unit, it would send me low multiple times a day. I needed another solution. Enter the second research-heavy phase of my Insulin-Free Type 1 Diabetes Journey. How to manage blood sugar without insulin. The Autoimmune Protocol has been the most comprehensive diet for me to discover what my food sensitivities are and manage my blood sugar without insulin. Through this diet I have discovered sensitivities to gluten, dairy, and eggs. I am still in the process of reintroducing foods, so that list may grow over the next months and years. After a rough fall 2018 of up and down blood sugar (which was the result of frequent cross-contaminations), I began taking insulin injections again in December 2018. Insulin-free diabetes lasted 19 months. 19 months of zero, none, nil insulin injections! How awesome is that? Changing my diet was 100% worth it, and I’m still seeing the fruit of that decision in very stable blood sugar numbers. The plan for now is to continue down the path of the Autoimmune Protocol reintroduction phase to hopefully bring my diet as close to Paleo as possible. I’m always learning and challenging myself to live a more healthy life. I’ll be sure to update here as I figure things out! Now that you’ve read my history, are you ready to take control of your future? Are you ready to take back control of your diabetes/autoimmune disease and impact your health for long-term good? Great! I’m ready to help! Eliminate gluten from your diet. This is baby step #1 if you aren’t ready or willing to dive right into an elimination diet (It’s a lot of work and can be scary!). Start a food journal. Write down every meal, blood glucose readings, mood, sleep, exercise, and anything else you think pertinent to your autoimmune disease. Add more vegetables to your diet. This is baby step #2 if you are still not ready for an elimination diet. You need to feed your body good food, and vegetables are very good food! If you aren’t sure where to begin with healthy eating, check out this series. Monitor results for 1-2 months. If your autoimmune disease has not improved dramatically or stopped all together, an elimination diet is needed to determine other food sensitivities. 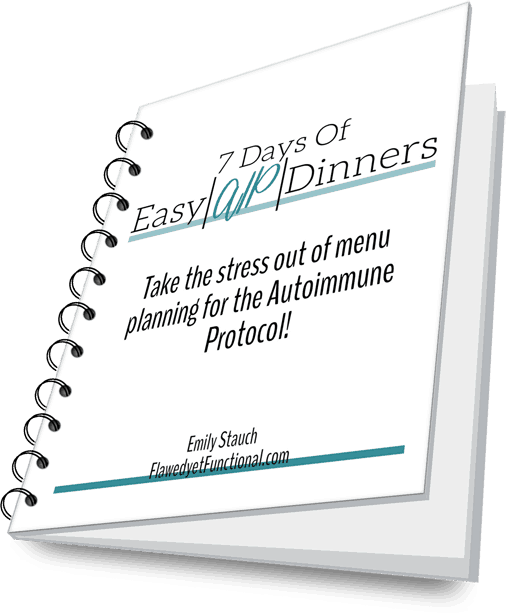 I recommend the Autoimmune Protocol as it is very thorough in discovering and addressing food sensitivities from severe allergies to sensitivities for autoimmune diseases. Follow The Paleo Mom, same author as The Paleo Approach. I’ve also tried The Autoimmune Solution by Dr. Amy Meyers. Read the book. It is an easy read and includes a complete meal plan for the 30 day elimination period. The weakness of this plan is the reintroduction phase. It isn’t spelled out well. Follow The Paleo Approach for the reintroduction process. The beauty of this book is little thinking, just make what she tells you to make for each meal!